We have all questioned what happened to the stimulus funds only to find that there are monies available from the package in Lee County here and now. The word needs to get out. It is imperative that those who qualify and have a desire to own a home apply for the assistance. Getting people in homes as a result of this funding will inadvertently benefit the market in all price ranges and all sectors. We will cover that aspect later. HOME DOWN PAYMENT ASSISTANCE Qualified persons or families can receive up to 20% (not to exceed $20,000) of the purchase price for a single family home. The single family home must be located in unincorporated Lee County and could be a condo or PUD (Planned Unit Development) or even a double wide mobile home 1976 or newer provided the land is owned underneath the mobile home. The home cannot be a duplex, have an attached or detached mother in law quarters or have a swimming pool. If all of the funds are not utilized as either down payment or closing costs the balance of the funds will pay down the principal balance. The funds cannot pay debts or collections, home inspection fees or home repairs. 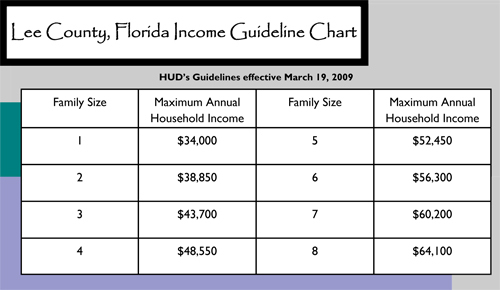 The homebuyers household income must meet HUD guidelines. The income for all members of the household will be considered. Non occupying coborrowers will be considered on a case by case basis. The home must be affordable for the occupants so the income of the non occupying coborrower will not change the mortgage amount or sales price. The coborrower may enhance the credit worthiness. All assets (including interest income) will be considered when calculating annual income such as checking/savings accounts, IRA’s, CD’s, cash value of life insurance, etc..
A ten year second mortgage will be placed on the property. No interest will be charged and there are no monthly payments. At the end of the ten years and if the property has been occupied and homesteaded each year a satisfaction of mortgage will be given and the second mortgage will not have to be repaid. However if the property is sold or leased during the ten year term or not owner occupied or homesteaded, then the prorated balance of the second mortgage will be due and payable. The second mortgage is self amortizing and will reduce 10% per year. Does anybody check? We are told this criteria will be verified. The property must pass Lee County’s minimum housing quality standards inspection. The inspection will be performed by the Department of Human Services inspector. The house must not exceed HUD guidelines for the number of persons allowed per bedroom. The property must be existing and have had a certificate of occupancy for at least one year. It cannot be occupied by tenants that are not purchasing the home. There are other rules and regulations all of which make sense and are easy to work with. Funds are available on a first come first ready basis. It would make sense to this writer that you get yourself in position to receive the assistance if at all possible. The lender applies for the assistance from Lee County on the borrowers behalf. The lender completes the lender referral form and several required documents including a fully accepted purchase contract. There is a $50 charge which can be paid by cashier’s check or money order from the purchaser. Make this non refundable application fee payable to Lee County BoCC. Lee County is now in the business of buying and rehabilitating foreclosed homes in targeted areas and then selling them to buyers at prices less than what was paid for them. This is all possible due to the $18 million infusion of stimulus funds. First of all, the county purchases properties below the appraised value. Professional contractors go to work on them making the properties very good buys in price and condition. The county will not raise the price of the homes as the economy improves. These homes will stay affordable. Some of the target areas include Lehigh Acres, San Carlos Park, East Ft Myers, North Ft Myers, South ft Myers, Pine Manor and Page Park. Go to nsp.leegov.com to view maps of the target areas. The incredible part is that the county will provide a silent second to the home buyer which means that the county may have purchased a home for $60,000 and then spend $$$ fixing it up and sell it for $30,000. The buyer is paying on the $30,000 mortgage. If the buyer stays in the home 15 years the silent second is forgiven. If the buyer decided to sell, rent or refinance before the 15 years have passed the buyer may be obligated to repay the subsidy partially or in full. This program is not for investors or second home buyers and only for the buyer’s primary homesteaded residence. The NSP program is not restricted to first time home buyers but the buyer cannot currently own a home and must be a resident of the United States. Buyers accepted into the program must complete an 8 hour homebuyer education class. Take a look at the income guidelines for a pleasant surprise. The NSP program looks at the income of the buyer from a low, moderate or middle range. The low income buyer can get up to 50% of the sales price as a silent second subsidy. 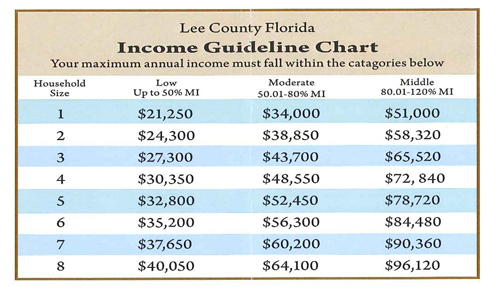 The moderate income buyer will qualify up to 40% of the price of the home and the middle income buyer at 30%.